Lisa’s voice is weaker than it was in 2014 when she was first diagnosed with ALS. Commonly known as Lou Gehrig’s Disease, ALS affects the parts of the nervous system that control voluntary muscle movement, including the ability to speak. 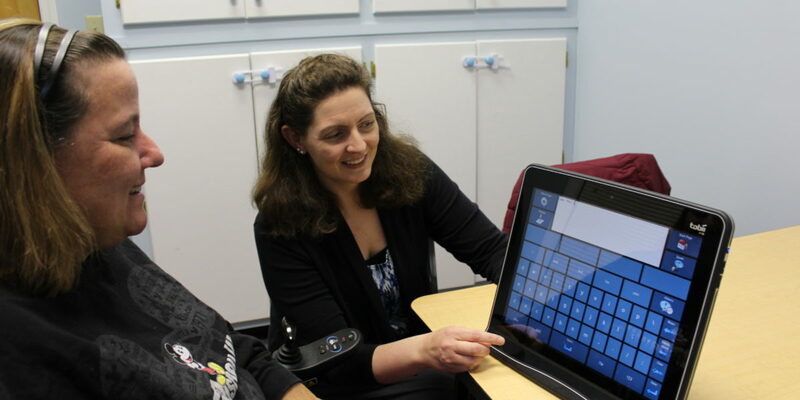 Pine Tree Society’s Communication Pathways team is helping Lisa create a message bank so when she’s no longer able to speak, she’ll still be able to communicate in her own voice using a specialized computer. For Lisa, eye-tracking technology is the perfect fit. Through the use of eye motion, she’ll be able to select words, letters and icons on a device to communicate what she wishes to say from her personalized message bank. Eye gaze, or eye tracking, is technology that is used for people who are unable to physically move a mouse themselves. A special camera picks up light reflections from their pupils and translates that movement into the movement of their mouse cursor. They can then select the item they are looking at by “dwelling” or staring at the screen for a length of time, blinking or clicking with a switch. For someone who has lost the ability to speak, being able to have a way to communicate in their own voice is very empowering and is also irreplaceable for loved ones.